One of the most reviled characters in Vedic literature is Manthara. 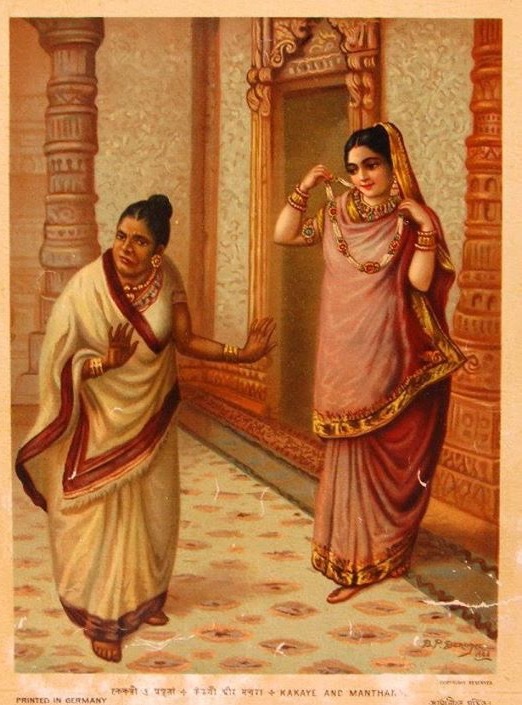 She was the hunchback maid of Queen Kaikeyi in the Ramayana. Kaikeyi was one of three wives of Emperor Dasaratha, who had four sons by the three wives. Emperor Dasaratha wanted to retire and crown the eldest son Rama as the new Emperor. It was then that the "evil" Manthara poured fear and doubt into the ears of Queen Kaikeyi. "You know, when Rama becomes King, he will only honor his Mother. You and your son the Prince Bharata will be dispossessed." She poured a lot of this evil talk into the ears of Queen Kaikeyi, convincing her that as soon as Rama became king she and her son would suffer under Rama's rule. It was a lot of nonsense - but it frightened Kaikeyi. Manthara reminded Kaikeyi that a long time ago she had saved the life of the Emperor Dasaratha in a battle. He had told her to ask any two boons she wanted. She had never used the boons. She went to the King and with a smiling face and a sweet voice, asked the King if he would still grant the boons. "Of course, anything for you, my queen" said the King. In those days, a person's word, especially that of the Emperor, were his bond and could not be violated. "Please make Bharata the King and send Rama to live in the forest for fourteen years" she requested. Emperor Dasaratha could not believe his ears. He was struck dumb and speechless. He could not violate his promises to Kaikeyi, but he could not violate his beloved Rama either! What could he do? Rama heard of Queen Kaikeyi's request. He had no attachment to being Emperor, only to fulfilling his father's wishes. He immediately took leave of the Emperor and went with his brother Lakshmana and his wife Sita to the forest. The Emperor died of a broken heart shortly thereafter. At that time demons were living on the Earth and tormenting the ascetics who lived in the forest. Rama slew many of these demons. The King of demons, Ravana, heard of this, and abducted Rama's wife Sita through trickery. With the help of Hanuman, Rama and his brother Lakshmana spent almost a year tracking Sita down and recovering her. To recover her, he had to slay the demon Ravana, who was tormenting humans and gods alike. This was the main purpose of God's incarnation as the human Rama. This, in short, is the story of the Ramayana, the most treasured story in India and many parts of the world. What most people do not know is that in her previous incarnation, the "evil" Manthara was Dundubhi, a Gandharvi (celestial being). She was instructed by none other than Lord Brahma Himself to take birth as the hunchback Manthara, and speak the "evil" words into Queen Kaikeyi's ears. If she had not spoken this way, Rama would not have been exiled into the forest. If he was not exiled, the demon Ravana, who was causing a lot of grief to the gods and holy men, would never have been killed. So this evil, hunchbacked woman, popularly reviled by those who read the Ramayana, was actually the linchpin in God's grand design to rid the universe of evil! This story is meaningful because it tells us that unless we are omniscient, it is better not to make judgments about who is good and who is evil. Of course, we want to keep our distance from those that harbor bad thoughts, but ultimately, the best attitude is to realize that everyone is playing their own part in the grand design. Rama Himself never for one second harbored a bad thought about Manthara or Queen Kaikeyi, who had him exiled to the forest.